Mercedes-Benz CLS 63 AMG driven | What Car? The high-performance version of Merc's latest four-door coupe. 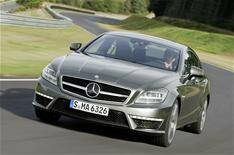 There has been a CLS 63 AMG before, but this new one is powered by a 5.5-litre twin-turbo direct-injection V8 mated to a seven-speed sports automatic gearbox. In standard tune you get 517bhp at 5250rpm and 517lb ft of torque all the way from 1750 to 5000rpm. Add the expensive Performance Package (as if the car doesn't perform without it) and at the touch of a button you get another 32bhp at 5750rpm and 74lb ft more torque, in this case from 2000-45400rpm. Oh, and the speed restrictor cuts in at 186mph instead of 155. Either way, the new car is 32% more fuel-efficient than its 6.2-litre predecessor. What's so good about it? In a word, smoothness. The power and torque delivery, the gearshifts and the responses of the electro-mechanical steering ensure the CLS AMG is a really fluid car to drive, even when seriously tramping on. Through a series of centre-console buttons you can adjust the firmness of the damping (it's never less than firm, but that doesn't mean it's uncomfortable) and the sharpness of the steering, throttle response and gearshifts. In the softest of the four options you even get engine stop-start, helping to save fuel in traffic. All of this means the CLS AMG is at home in any surroundings and all driving conditions, and although it's clearly a high-performance car it's discreet. Other major attributes are a fabulous cabin with S-Class-quality fittings and switchgear. There have to be some faults, surely? We're struggling to think of many, to be honest. It's only a four-seater and the ride is firm around town, but you'll be prepared to put up with that if this is the sort of car that interests you. Getting into and out of the back requires more dexterity than with a saloon, and the central control system linked to a dashboard screen is not the most instinctive or quickest to use but not the worst, either. The best AMG car we've ever driven and that includes the SLS supercar. Totally at home in any surroundings. Now, where do we sign that order form?